It’s that time of year! New York City has gone to the dogs for the 136th Westminster Kennel Club Dog Show, and the rest of the country gets to watch it live on the USA Network and CNBC. Held at Madison Square Garden, Westminster showcases the finest, fairest and fluffiest dog breed champions from around the country. 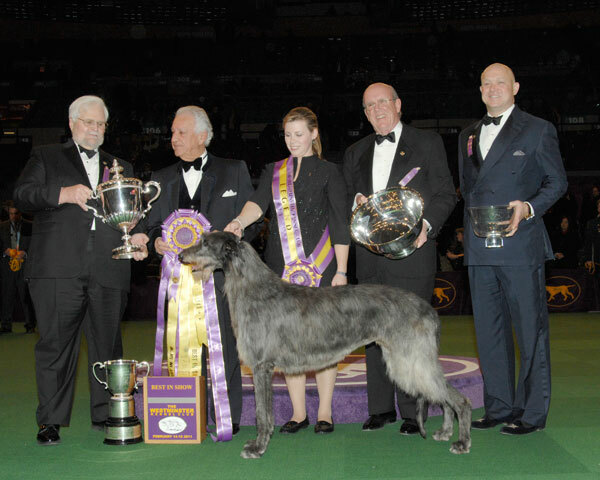 The 2011 Best in Show winner was a native Virginian, a 5-year-old Scottish Deerhound from Warrenton named Hickory (see photo, from www.westminsterkennelclub.org). The day after her big win Hickory went on a whirlwind media tour, visiting The Today Show, The Early Show, Good Day New York, Fox and Friends, Martha, Bloomberg News, Fox News, press events at the Empire State Building and Sardi’s Restaurant and meeting Donald Trump. The most popular breeds entered at this year’s show are Rhodesian Ridgeback (40), French Bulldogs (39) and Labradors (38). A total of 2,077 dogs are entered, representing all of the 185 eligible breeds and varieties. Breeds eligible for and entered at Westminster for the first time include American English Coonhounds, Cesky Terriers, Norwegian Lundehunds, Entlebucher Mountain Dogs, Finnish Lapphunds, and Xoloitzcuintlis. Yes, I know what you’re thinking. And I wanted to know too. A) What is a Xoloitzcuintli? And B) How the heck do you pronounce it? ?